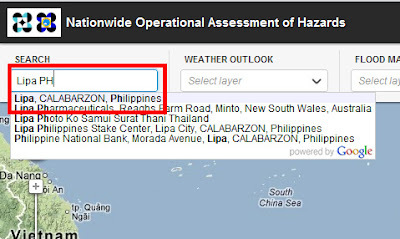 The National Operational Assessment of Hazards or NOAH was launched yesterday to assist local government units and other decision makers in times of impending adverse weather and floods. 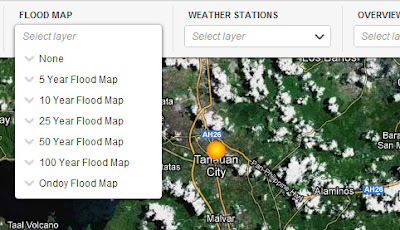 The system is based on Google Maps upon which can be superimposed information about weather-related concerns. Ordinary citizens may also access the system for even the mundane decision of bringing an umbrella or not. 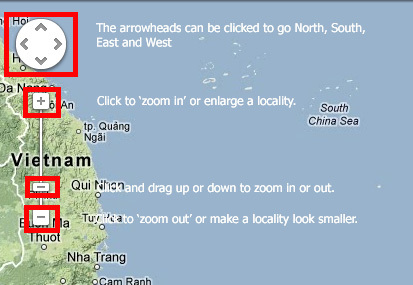 This post is a pictorial tutorial on the use of the system. 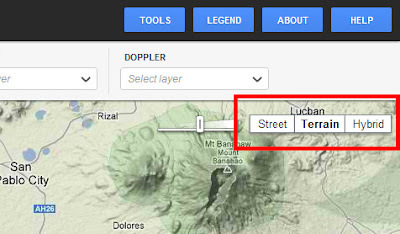 Use Google Maps’ tools for locating a place, zooming in and out or navigating north, south, east and west. Alternatively, you may use the Search Box to type in a particular location. 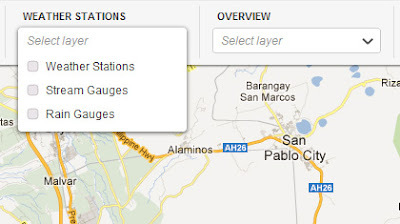 Wait for a few moments for the system to load a Google Maps location, highlight the location and hit Enter or Return. 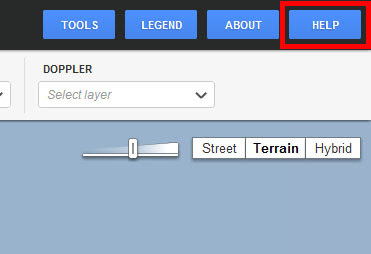 The default view is ‘Terrain.’ Use the tools below to change to ‘Street’ view or a hybrid street and satellite photo view. The top menu shows ‘arrowhead down’ icons to drop down information menus that can be superimposed upon the maps. 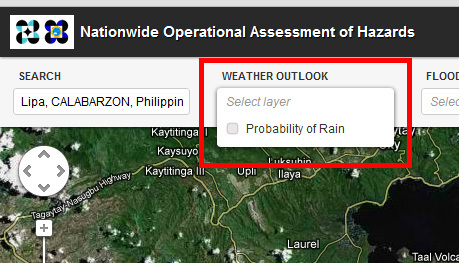 The Weather Outlook currently offers the probability of rain. Choosing rain probability will bring up clickable yellow buttons which when clicked will pop up rain information. 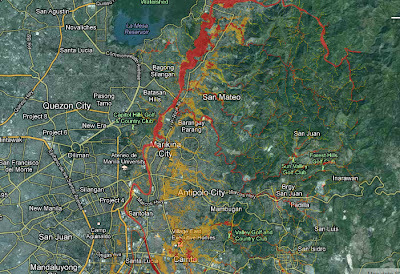 The Flood Map will yield dangerous flood path ways. 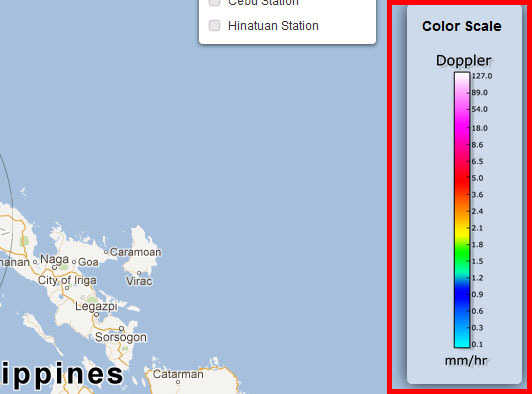 This is not yet real time. The 5-year Marikina flood historical danger pathways are illustrated in red, orange and yellow in the second picture. Clicking ‘Legend’ in the upper right hand corner menu brings a flood hazard legend to help interpret the danger presented by floodwaters. 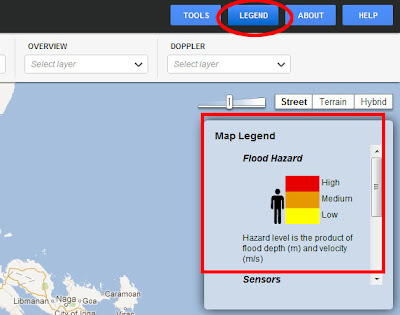 An icon of a man is conveniently shown to indicate how far up floodwaters reach. 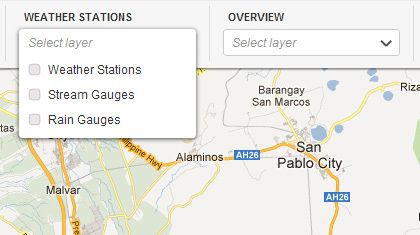 The Weather Stations menu yields Weather Stations, Stream Gauges and River Gauges where available. 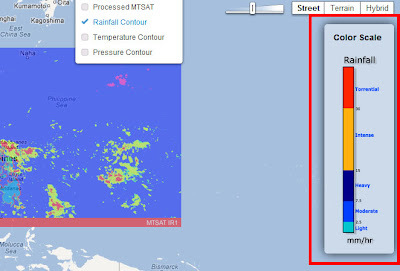 The Overview menu offers MTSAT (multi-transport satellite) views with rainfall, temperatures and pressure information. 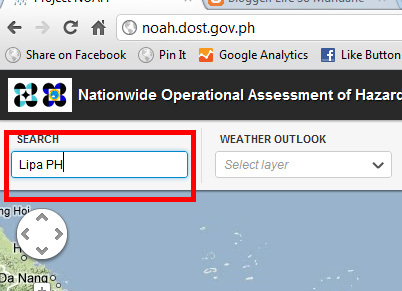 The toolbar to the right shows a scale to help interpret the information. 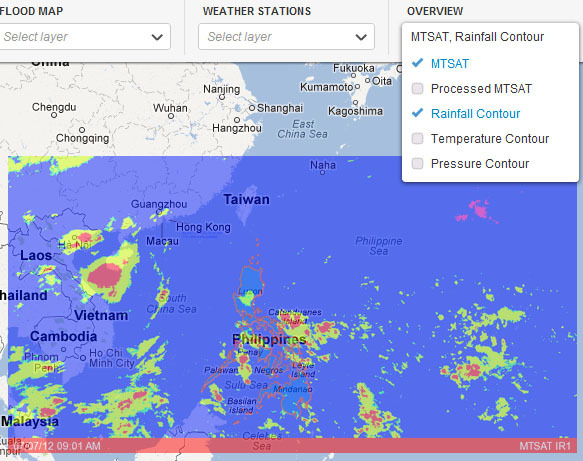 Doppler radars are specialized radars that can produce speed data on objects from a distance. Clicking the Doppler Menu will bring information from Doppler radars where available. 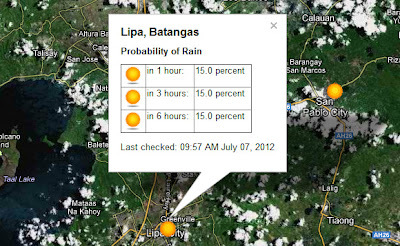 The picture below shows information from the Tagaytay radar. 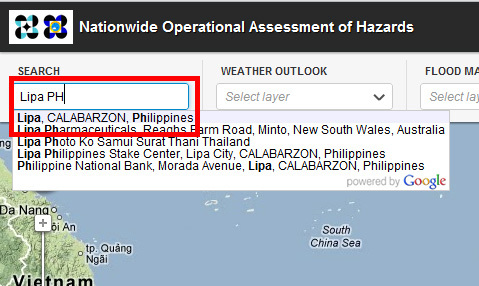 The circle shows the radar’s range. 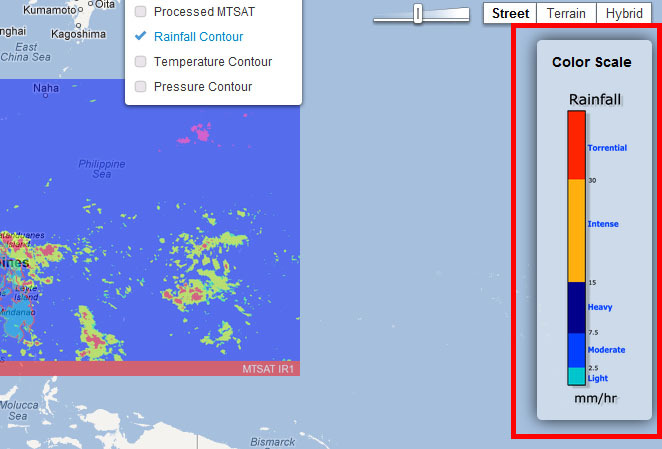 The scale to the right again allows viewers to interpret the moving objects in terms of the amount of rains they bring in mm/hour. Information at the bottom of the browser tab shows rotating current information on the rainfall intensity in selected localities. 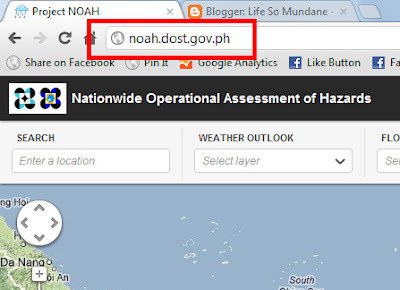 For more detailed information on how to use NOAH, please refer to the system’s Help section at the upper right hand corner of the browser’s tab. Please share this post. 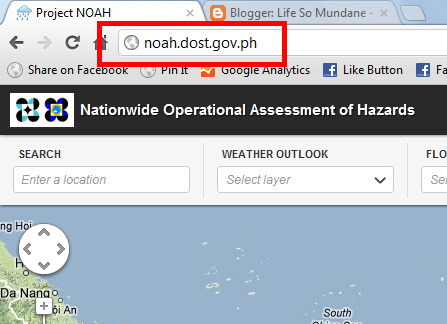 You can never tell when NOAH will save somebody's life.